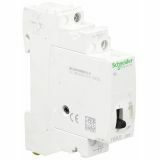 Single-phase relay, SCHNEIDER, A9C30831, 230VAC, impulse, 50ms-1s, 32A/250VAC, NO Latching relay SCHNEIDER ELECTRIC for DIN rail mounting, nominal voltage 250 VAC, 32 A, NO. Single-phase relay, SCHNEIDER, A9C30812, 230VAC, 50ms-1s, 16A/250VAC, 2xNO Latching relay SCHNEIDER ELECTRIC for DIN rail mounting, nominal voltage 250VAC, 16 A, 2 x NO. 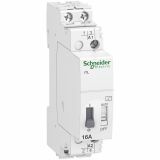 Single-phase relay, SCHNEIDER, A9C30811, 230VAC, impulse, 50ms-1s, 16A/250VAC, NO Latching relay SCHNEIDER ELECTRIC for DIN rail mounting, nominal voltage 250VAC, 16 A. 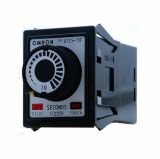 Time relay AT8N, 100~240VAC, delay turn on/off, 0.05s~100h, 5A/250VAC, 2xNO+2xNC Analogue time switch AT8N with supply voltage 100 ~ 240 VAC, 6 operating modes, output DPDT / SPDT + SPDT and range from 0.05 s to 100 h.
Analogue Time Relay, AH3-ND, 12VDC, SPDT or DPDT, 5A, 1min - 10h Analogue time relay AH3-ND with 12 VDC supply voltage, 2 selectable modes: DPDT - mode A or SPDT - mode B, 5 A contacts current and time range from 1 min to 10 hours. Mechanical Quartz Timer MT 20, Brennenstuhl, Primera-Line, 220VAC, 16A, 3500W, 24h, 1506530 Mechanical time relay Primer Line from Brennenstuhl which controls electrical loads with power up to 3500W(active load) and rated current 16A.Up to 96 on/off switching times per day can be set up. Shortest switching time is 15 min. LED operating indicator. Childproof socket. Repeat Cycle Timing Relay ATDV-Y, 0-60min, 12VDC, NO+NC, 250VAC, 3A This relay is suitable for cyclical processes regulation and control with the option for T impulse and T pause setting. The time setting range is 0-60 min. Repeat Cycle Timing Relay ATDV-Y 0-60s, 24VDC, NO+NC, 250VAC, 3A Timing Relay ATDV-Y 0-60s, 24 VDC, NO + NC, 250 VAC, 3 A repeat cycle. Repeat Cycle Timing Relay, ATDV-Y, 0-60min, 24VDC, NO+NC, 250VAC, 3A Repeat Cycle Timing Relay, ATDV-Y, 0-60min, 24 VDC, NO + NC, 250 VAC, 3 A.
Analogue Time Relay, JSZ8-C-03, 24VDC, 2NC+2NO, 250VAC, 3A, 0 - 10 s/10min Analogue Relay, JSZ8-C-03 with timing range 0-10 s/10 min, NO+NC (standard) contacts, NC+NO (switching) contacts and supply voltage 24 VDC. Wiring diagram and inputs - outputs are shown on the relay! List Price 29.90лв. VAT Incl. 28.40лв. VAT Incl. Analogue Time Relay, JSZ8-C-05, 24 VDC, 2NC +2 NO, 250 VAC, 3 A, 0 - 60 s/60 min Analogue Relay,JSZ8-C-05 ,with timing range 0-60 s/60 min, NO+NC(standard)contacts, NC+NO (switching) contacts and supply voltage 24 VDC. Wiring diagram and inputs - outputs are shown on the relay! Analogue Time Relay JSZ8-G-05, 24 VDC, 2NC +2 NO, 250 VAC, 3 A, 0 - 60 s / 0 - 60 min Analogue Relay,JSZ8-G-05 ,with timing range 0-60 s/60 min, 2NC+2NO contacts and supply voltage 24 VDC. Wiring diagram and inputs - outputs are shown on the relay! Analogue Time Relay, JSZ8-A-05, 24 VDC, 2NC +2 NO, 250 VAC, 3 A, 0 - 60 s/60 min Analogue Relay,JSZ8-A-05,with timing range 0-60 s/60 min, 2NC+2NO contacts and supply voltage 24 VDC. Wiring diagram and inputs - outputs are shown on the relay! Analogue Time Relay, AH3-2D, 24 VDC, 2NO +2 NC, 220 VAC, 5 A Analogue time relay AH3-2D with supply voltage 24 VDC. With two normally open and two normally closed contacts (2 NO + 2 NC). THE RELAY IS WORKING WITH THE "DIN" TIRE, WHICH IS SOLD AT A SEPARATE PRICE !!! Analogue Time Relay, ATSS-7F, 220 VAC, 2NO +2 NC, 250 VAC, 3 A, 0 s - 10 s ATSS-7F OFF timer with supply voltage 220 VAC аnd working range 0 - 10 sec. Analogue Time Relay, NSY, 110VAC, 50/60 Hz, 2NO +2 NC, 220 VAC, 0-7m10s Analogue time relay NSY with supply voltage 110 VAC and working range, 0-7m10s s.
Analogue Time Relay, JK9263,380 VAC , NC + NO, 250 VAC, 4 A, 5 min / 15 min Analogue Time Relay, JK9263, with working range 5 /15 min, 1NO+1NC contacts and supply voltage 380 VAC. Timer TB35, 100 - 220 VAC, 15 A, 3 kW Analogue time relay with quartz stabilized motor. 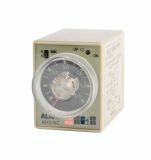 The 24-hour electromechanical timer is used to turn on and off a set 24-hour program of active loads, inductive loads, power meter tariffs, lamps, and many other consumers. Timer TB35, 100 - 220 VAC, 15 A, 3000 W Analogue time relay with quartz stabilized motor. The 24-hour electro-mechanical timer is used to turn on and off a 24-hour program of active loads, inductive loads, power meter tariffs, lamps, and many other consumers. Analogue Time Relay, AH3-NC, 12VDC, SPDT or DPDT, 5A, 6s - 60min Analogue time relay AH3-NC with 12 VDC supply voltage, 2 selectable modes: DPDT - mode A or SPDT - mode B, 5 A contacts current and time range from 6 s to 60 min.